Seamless control makes you operate easily and quickly. Ergonomic design. Fits naturally in your hands with precise and responsive controls so you can enjoy hours of wireless gaming. 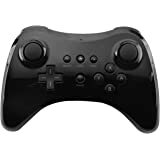 Features smooth and precise dual analog joysticks to allow for immense gameplay on titles like Minecraft - Super Smash Bros - Super Mario - Bayonetta etc. 100% Brand New, made with the highest quality material. 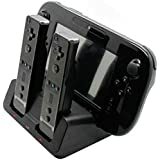 Our this kind of game controller for Nintendo Wii U Pro adopts the highest quality and ergonomic design so you can enjoy hours of wireless gaming. Your games, your way. However you think of your gaming style-hard-core, old school, or purely nostalgic - the Controller for Wii U Pro puts you in the game. 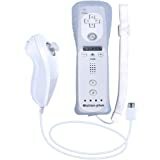 Designed for accessibility and extended gameplay comfort, the Controller for Wii U Pro features the dual analogue sticks and ergonomic button layout that you've come to expect, as well as a rechargeable battery that can last up to dozens of hours on a single charge. 6. 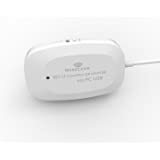 Compatible with Wii U system or games. NOT COMPATIBLE WITH THE WII SYSTEM OR GAMES. How to Pair a Wii U Pro controller with the Wii U Console? Step 1.While on the Wii U Menu, press the SYNC Button on the Wii U Console to display the controller pairing screen. Step 2.Press the SYNC button on the console again until the screen shows the controller type you want to pair. Step 3.Press the SYNC button on the Wii U Pro Controller. Step 4.Follow the on-screen instructions. Step 5.The Player LED on the controller will light up when the pairing is complete. The Player LED indicates the player number of the controller currently in use. Purchased mainly for Zelda - Breath of the Wild on Wii U. As other reviewers have said, the joysticks on this controller can squeak a bit and can stick in place, causing your character to keep walking. The small Phillips screws on the back made it pretty simple to take apart-- I applied a small amount of lubricant underneath each joystick, moved it around in a circle, and the squeak was gone. reassembled and now this controller is great! I shouldn't have to do any maintenance on a new product, but it was a simple fix. This controller was definitely worth the purchase, and far less cost than the 'official' Nintendo one that I couldn't find reasonably priced anywhere. 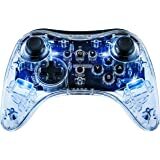 3.0 out of 5 starsIt's a generic Chinese controller. Seems fine so far. It works. Time will tell. It seems to disconnect if it doesn't detect input for about a minute, which is VERY annoying. I'm guessing a battery saving technique? I wish I could be changed to maybe 3 to 5 minutes. I don't know how long I'm supposed to charge it for. My question went unanswered. The poor documentation doesn't say, so one would assume this means to leave it plugged in until the charging light goes off. Well, mine never went off, so I don't want to overcharge the battery. Remember dealing with those days? If anyone knows, please let me know. The battery is replaceable without having to take the whole controller apart, which is nice. The battery looks like a DS Lite battery. I'm dinging it for the lack of instruction on the whole charging thing and the annoying power save mode. Unless you are willing to pay through the roof for a new one by Nintendo, or take your chances with a used one, this is probably your best bet. 2.0 out of 5 starsLooks exactly the same, good build quality, but input is laggy. The good: it looks exactly like the original Wii U pro controller, the size, the hand grip, everything, so it’s very comfortable. The material is slightly different, but unless you compare side by side, it’s hard to tell the difference. The bad: here’s the more important part, it lags, the joystick also feels different and not that good when you actually start playing. I can live with the feel of the joystick, but the input lag is too important not to ignore. When playing games like MARIO makers or any of those that require precise input, it doesn’t work well at all, after I release my the joystick after a long hold, it will still move forward, even if I change direction, i can tell it will take about 10~20 milliseconds to accept the new input. The action buttons don’t feel as bad. If you want to play any action game, racing games, any those that requires precise input, don’t get it. But if you are only playing strategy game that doesn’t require precise input, it’s actually a very good alternative. I actually ordered this only to use it on PC, based on a couple of comments that it worked well on PC. I should've known better though, because in the Q&A the seller even states it doesn't work with PC or anything other than the Wii U, but I was hopeful. I have Windows 10, and couldn't get it to detect the controller at all, sadly. I tried for a couple of hours with no success. So those that say it works for PC, not sure how they managed to get it to work, but if you're on Windows 10 I would say don't hold your breath. That being said, it's still a pretty decent controller for the cost. It doesn't really feel cheap, but I wouldn't say it feels premium either. It's black, lighjtweight glossy plastic. The joysticks feel pretty good and the buttons aren't too hard to press, with the exception of the D-pad, which does require a bit of effort to press compared to a PS4 or even Xbox One or Xbox 360 controller. It comes with a roughly 6 foot mini USB cable. 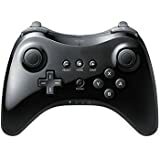 Overall, I give it a 3/5, and I would say I would recommend it if you need a cheap budget controller that only works for the Wii U.
I recently bought a used WiiU console at our local goodwill, and unfortunately it doesn't have a controller aside from its gamepad of course. 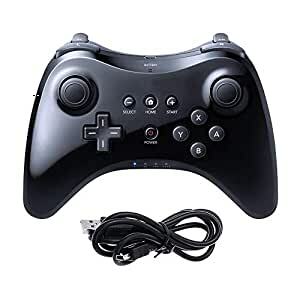 Excited I am to play Smash Brothers on it, I find it hard to control with the gamepad so I try to get the wiiU pro controller. Unfortunately, its hard to find it nowadays as we all know its been phased out by Nintendo. So, the only solution is here(amazon) or ebay, even so if you find one it will either be used, refurbished or bnew at a ripped off price. So the main option is really to buy a generic one. And so I chooses this for its price and closeness to the OEM one. So far so good, I like it. The feel of it is just perfect to my hands and the way its made you could never tell from afar that its not the orignal one. Now; gameplay wise, I did not noticed any lags or anything weird on it. It is responsive as it should. So its a good option to those in need of a controller or additional one for their WiiU.